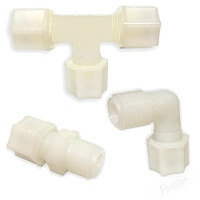 Nylon Body Compression Fittings by Jaco are chemical resistant and feature a stainless steel gripper. Dis-assembly of nut is not required for tube insertion. Nylon has good resistance to organic solvents, oils and gasoline. Good strength at high temperatures. Material rating: -40° to 200°F. Cold and hot-water applications. Long-time weathering resistance. Good impact resistance, both single and repeated. Not recommended for use with ammonium, boric acid, calcium, sulfuric acid, or hydrochloric acid. F.D.A. listed. Also N.S.F. listed.